In the bronze age Scilly comprised one big and one small island (St Agnes). The Isle of Scilly constituted a separate world, a somewhat mystic world reputed to be the Isle of the Dead - and certainly the sheer number of burial mounds on the islands testifies to that. The 'isle of the dead' could also be regarded as an 'isle beyond time' or beyond earthly normality. The tradition of a sunken landmass, Lyonesse, perhaps the Scilly island or a landmass between Scilly and the mainland, adds to this mystique. Culturally Scilly was connected with West Penwith, and whatever happened in one generally happened in the other, as evidenced by the chambered or entrance cairns uniquely built in both places from around 2500 BCE. Though these are called 'Scillonian chambered cairns', their construction seems to have started first in Penwith in the later neolithic. The people of the neolithic and bronze ages were steadfast mariners. Archaeologically there are signs of plenty of marine contact stretching from Iberia to Britain and Ireland to the Orkneys and Denmark. In good weather the Scillies and West Penwith are intervisible, and the journey could be done in a day using sail and paddle from the islands between Great Ganilly and Sennen beach, or perhaps to Priest's Cove at Cape Cornwall. Ganilly is now an island, site of the notable ancient settlement of Nornour, but in the bronze age the Scillies formed one main island. The presence of beacon hills on both sides of the sound separating the islands and the mainland suggest a signalling system too, for practical and religious reasons. The Isles of Scilly could also have acted as a stopover and safe haven for marine traffic passing between Brittany and Ireland and the Irish Sea, avoiding the strong tidal currents off Land's End. It is commonly held that the Scillies were first permanently occupied around 2250 BCE at the beginning of the bronze age. Earlier settlement, or at least seasonal settlement, is likely. At that time most of today's islands except St Agnes, Gugh and the western islets formed one island - the land has sunk by 5-6 metres relative to the sea since then, and the waters between the islands are still shallow. This means that some ancient sites now lie underwater between today's islands, though since the ancients had a habit of locating sites on hilltops and higher ground, most sites are still on land today. 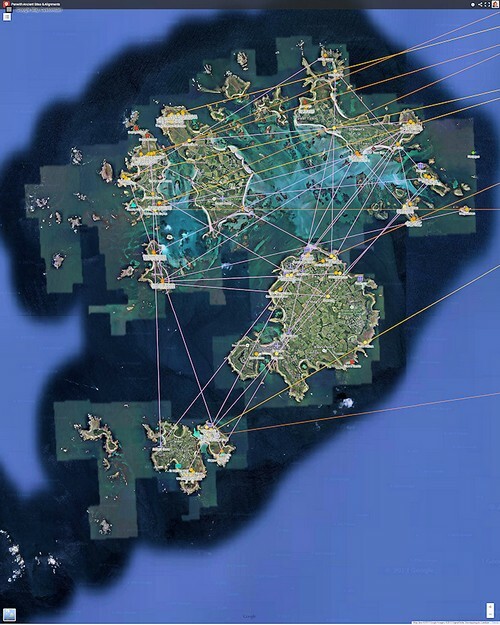 To do justice to Scilly's alignments, the normal geomancers' rule of four or five sites to make an alignment has been reduced to three sites - otherwise, much is lost. The islands are not big enough for a preponderance of four-site alignments, in most cases. Alignments fall into two main types: those local to the islands (violet) and those spanning the sound to the mainland (yellow and orange). The pattern of alignments slightly resembles a 'cat's cradle' with a predominant NE-SW orientation. the multiple cairns on South Hill on the island of Samson. 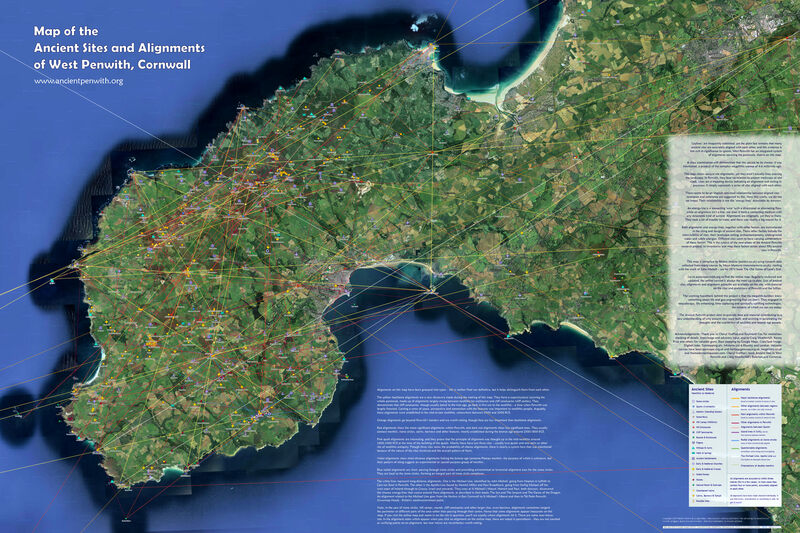 There are four incoming 'backbone' alignments from the mainland, and five other alignments discovered thus far, all of them striking at least two sites on the Scillies and ending in the west of the islands. These longer-distance alignments highlight Samson Hill on Bryher, Knackyboy cairn on St Martin's, Obadiah's Barrow on Gugh and the Castle Down cairnfield on Tresco. Two of the backbone alignments come from Boscawen-ûn (one of these from Godolphin Hill and the other from St Michael's Mount). One alignment comes from the Merry Maidens and one from Cape Cornwall, St Ives Head and possibly further upcountry. Of the other alignments, one passes through Wolf Rock in the middle of the sea, passing through three sites on the Scillies and ending at Wolf Rock - which in ancient times would have protruded more markedly from the sea than today. Other alignments go from the Scillies to prominent headlands on the Penwith coast such as Cape Cornwall, Maen Castle and Carn Lês Boel, or to hills such as Chapel Carn Brea (an ancient beacon hill). One alignment goes even as far as Carn Brea near Camborne. Alignments SC06 and SC18 are parallel to each other, possibly pointing at the summer solstice setting point of the sun (or its winter solstice rising point in the other direction). This is also the case with SC15 and SC17 on St Martin's, though with a different orientation. It's also worth noting two 'radiation points' where alignments fan out at a series of relatively close angles, at the Chapel Downs cairns on St Martin's, and at South Hill on Bryher. For more about the Scillies, try here too.